Last Wednesday, Gary and I made one of our semi-regular trips to visit Kri-Bro at the Spotted Pig, and as usual, a splendid time was had. Carlos and Rob joined us late in the game and took over our stools for the second “Keep Kristin Sane” shift. Gary and I left about an hour later and began the trek back from Manhattan to the dirty Jerz. We were both quite intoxicated. Yes. I peed my pants. Just a wee bit (little pun there), but enough. The last time I experienced this little incident, I was in the first grade. It was close to Thanksgiving and Mrs. Murphy (my first real life hottie crush) had us making Pilgrim hats and Indian headdresses out of construction paper and Elmer’s glue. Everyone was having trouble, and Mrs. Murphy was getting impatient, so she told us we couldn’t raise our hands until Art was over. Only problem was, I had to go to the bathroom, but took her admonition seriously. So I squeezed and suffered and soon there was a puddle under my little wooden chair. And to this day, I can remember the whispered exchange I had with Abby Dochat. Soon, Mrs. Murphy became aware of the predicament, and before long, my Mom was there to pick me up and take me home early. And the kicker was, because I got to cut school, nobody made fun of me. 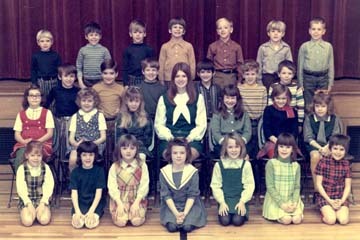 In fact, I was the ENVY of everyone else in my class. They waved goodbye jealously as I put on my jacket and headed out. I have to imagine that at least a few other youngsters were squeezing their bladders trying to emulate my actions. Anyway. Back to last Wednesday. Post-pee, the first thing I did (after washing my hands, but before taking a shower) was text message everyone I had just been hanging with to tell them of my pants-staining tale. And then, the next day at work, I must’ve related the story a dozen times. And now, here I am, writing about it for all the world (okay, a hundred or so people) to see. More than one of my friends wondered aloud why I would ever want to share such an embarrassing anecdote. There are a number of reasons. Part of it is that I think it’s a funny story. Part of it is self-deprecation. And yes, part of it is self-absorption (Hey! Listen to a story about ME!). But I think the main reason is, I’m not embarrassed by it. I just don’t care. I’m just a stupid, gross animal like the rest of us, sometimes my body doesn’t do what I want it to (boy, doesn’t it). I do smart things, I do dumb things, sometimes I’m a good person, sometimes I’m not. In the grand scheme of things… oh, wait. There is no grand scheme. I forgot. So why not laugh about it? Whoops, sorry. My nihilism is showing. wish i was able to go to future pee parties at the pig!! miss u guys.